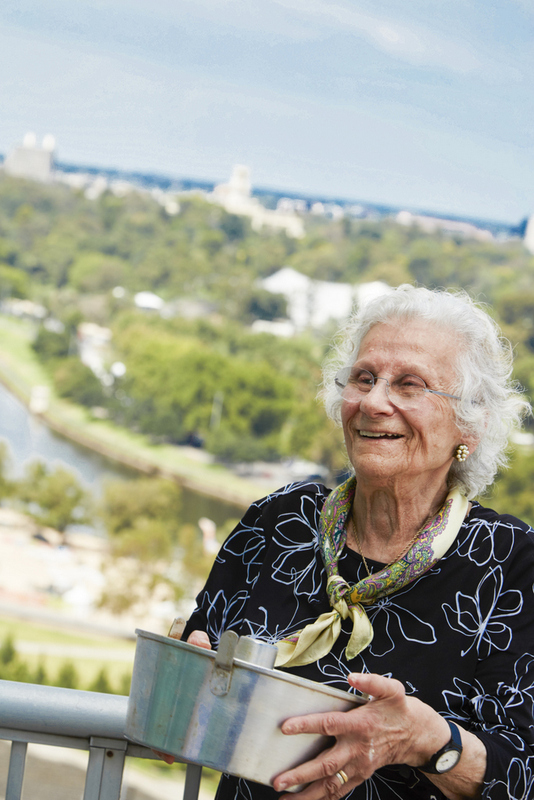 This is the first blog post that I have found it almost too sad to write, as I am reporting the death of 2 of the wonderful grandmothers from this project, titans of the Melbourne Jewish community, Saba Feniger and Baba Schwartz. Both Holocaust survivors, both raconteurs, both authors, both women devoted to their communities and their families. Both witnessed and survived so much horror and experienced so much loss, yet neither was bitter. They were resilient, intelligent, vibrant, warm, ebullient, formidable women, wives, mothers, grand-mothers and great-grandmothers, the heart of the new families they built after having lost relatives during World War Two. I will write 2 separate tributes since both led such rich lives. In fact, they were such strong personalities that I almost can’t believe they are not here with us any longer. Baba Schwartz, cake tin in hand. She baked yeast cakes for the Sabbath every week for decades and said, "In Hungary, nobody was a hero if she could bake." I am starting with Baba Schwartz, since her funeral took place in Australia today, 89 years after she was born in Hungary, to an Orthodox Jewish family. The wonders of the digital world meant I was able to “be” there from Jerusalem, as the funeral was live-streamed from the Melbourne chevra kadisha. Baba and her sisters Erna and Marta as young girls in Hungary in the 1930s. That life was ended for Jews by the Holocaust. Ninety per cent of the Jews of their town of Nyirbartor were murdered during World War Two. All 3 of Baba’s sons spoke, incredibly moving tributes which were loving of course, but also admiring and respectful; they were aware they were the sons of a remarkable woman, grateful for the privilege of having had her as their mother, despite their aching loss. In an interview Paul Keating gave a few years ago, he described the fierce love of his mother and grandmother as an asbestos-coating that protected him all the rest of his life. Nothing could touch you when you were defended with that shield. Baba’s youngest son Danny Schwartz made me think of this as he described the force-field of Baba’s love, which always made him walk 10 feet tall. Baba Schwartz, with her youngest son Danny. In one of their last family photos, Danny, his wife Uschi and his older daughter Delilah are standing around Baba, who is seated. Uschi is holding her new baby, Benji and from her chair, Baba is holding onto Benji’s foot. She was always connected to her family. The first things that struck you about Baba were her intelligence and her happiness. Happiness was not a given, in light of her harsh experiences during World War Two, where she lost her beloved father, and suffered the degradation, pain and horror of the Auschwitz death camp. Baba always said – including to me when I was interviewing her for this project – that she was born with a profound sense of gladness, and that she believed it came from her mother’s own happiness when she was pregnant with her. At Baba’s funeral today, her middle son Alan Schwartz, looking deeper, says his mother chose to be happy; despite everything, she sought the positive. Perhaps it’s this that made her a magnet for so many people - including me. Baba baking with her son Alan Schwartz, who has become a passionate bread-maker. I first met Baba Schwartz more than 3 years ago, through this project. She welcomed me warmly, and opened her heart to me, sharing her painful story. I found her radiance and her ability to see right through to the heart of things irresistible. It didn’t hurt that all this was accompanied by flour, yeast and sugar, wisdom shared as she showed me how to bake an array of delicious Hungarian yeast cakes, filled with poppy seed and chocolate, walnuts and lemon, cream cheese and apricot jam. The chocolate babka - or Ugah - that Baba baked each Friday. Baba was a great story-teller – another draw-card – and we spoke in a mixture of English and Hebrew, which she learnt when she came to the young state of Israel in 1949, living in a village set up by Hungarian Holocaust survivors. She taught herself the new language, by sitting down with 2 bibles, one in Hungarian and the other in Hebrew. “In the beginning, God created the Heavens and the Earth…"
Who could resist such a romantic image? I also liked how she added more details with each re-telling. “Yes, AND there was almost no light. We had no electricity there in Moshav Shafir. I learnt Hebrew by the light of a kerosene lamp. I had to keep the lamp switched to low, so that my husband could sleep, because he had to work in the fields the next day,” Baba said. Next, came the joke. On the third re-telling Baba recounted how on a trip to Israel 20 years later, she caught the bus to Moshav Shafir, where to her surprise, the bus driver recognized her. “I can’t believe you remember me after 20 years!” Baba said. “You were the only one of those Hungarians who knew Hebrew back then. And you still are today!” the bus-driver replied. And that’s how it was with Baba. Once she let you into the circle of her love, you were all the way in. You became part of the laughter amid the sad stories, the wisdom and the yeast cakes; the extra family that she added to the sons, grandchildren and great-grandchildren to whom she was devoted. Morry Schwartz, Baba’s oldest son, remembers how proud he was to be the son of a beautiful vibrant young mother, somehow set apart from the other Survivors at Moshav Shafir, and how later those same qualities meant his mother had more teenage girlfriends buzzing around than he did. Photo of Margit and Andor, known to everyone as Baba and Bandy, with their first son, Morry Schwartz, 1950. "I really love your mother,” was something he heard often. I feel that I fall into that category, no longer a teenager, of course, but a younger woman whom Baba swept up in her train. I was fortunate – really fortunate, I realise now – to spend a whole day with Baba just over a week before she died. She was in Israel for the wedding of her grand-daughter Hannah. I came to Tel Aviv and we discussed stories I had been covering, since Baba never lost her curiosity about the world. I also showed her photos of the cakes I had made to her recipes. She was as happy as if she had baked them herself. I was especially proud of the Hungarian cheese-pockets and was adapting a Corsican recipe where a cheesecake is baked on a chestnut leaf, so it could be baked on a local Jerusalem vineleaf instead. Cheese-pockets! Yeast dough, filled with farm cheese, lemon rind and sultanas. I brought along some of my failed attempts, and Baba was enthusiastic even about them. She gave me advice about how to get the cheese right next time. I went back home and did what she said, and of course those were the best versions yet. I sent her an email – yes, 89 year old Baba also did email – to tell her and to thank her. I don’t know if she received it before she passed away, so I am thanking her publicly now. A personal sweet cheese morsel, bakked on a vineleaf. My greatest joy that day was being able to show Baba some of the completed pages from the Food is Love cookbook which we are in the process of putting together, with the stories and recipes from this project – including hers of course. She was thrilled but her comments were incisive, as well as supportive. Baba epitomized triumph, the personal triumph of not being destroyed by suffering, while never forgetting who she was, and where she came from. She was also unaffected by the wealth she came to know in older age. Danny and Uschi Schwartz with Baba, in her old home in Caulfield in Melbourne. Her experience during the Holocaust didn’t tarnish what came later, but it never left her either and was a reference point for everything else. Once, during a difficult part of our interview, I offered to stop, not wishing to burden her with the pain of re-telling this story. Baba said we should continue, for the memories never left her. “For me it is a permanent partner, I live with this. It’s by now fossilised into me, it became a big, big stone inside me. We are the ones who suffer for the crimes of others. It’s painful,” Baba said. Baba's grand-daughter Delilah Schwartz lights a candle on the path of remembrance, which Baba endowed in memory of her father at Yad Vashem, the Holocaust Memorial in Jerusalem. And yet, when Baba was in Israel last year, for the wedding of another grand-daughter, Delilah, she also spoke of her great contentment and took to the dance-floor to express her joy. “And was I proud to be dancing with my 3 sons at that wedding?” Baba asked smiling widely, before adding more reflectively, “Now I am content. Happiness is a state that comes and goes, but contentment is something different, like a great river that flows through your life." At her funeral, her sons affirmed that the end was swift and relatively painless. Baba was surrounded by family, by love and Jewish songs. Although she knew death was near, she showed no fear. She quoted Leonard Cohen; his latest dark song, written not long before his own death. Baba may have been ready to go, but we who are left behind are not as prepared and now have to adjust to her loss. Rest in peace dearest Baba. Your memory is already a blessing.